Export Templates are an important feature for viewing, filtering, exporting, inserting and sharing your scan records. You can select which criteria your scan records are filtered by, and exactly what sort of details appear when you export scans. To get to your Export Templates, simply head to the Scans page, and select the Export Templates tab. 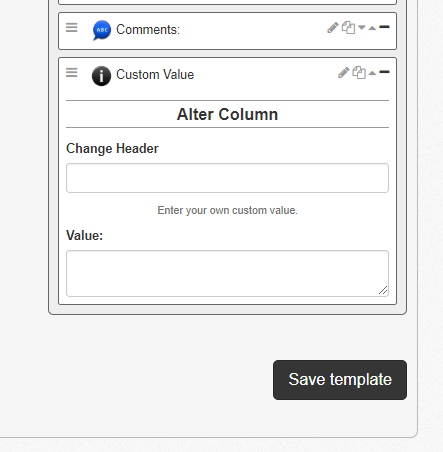 Next, select “Create a Template” and you’ll be brought to this screen. On this page, you’ll be able select the different values and questions you want displayed in the exports of the scan records. You can also select the order that they appear in the report. The values appear in descending order, so the first value will on top will appear first. 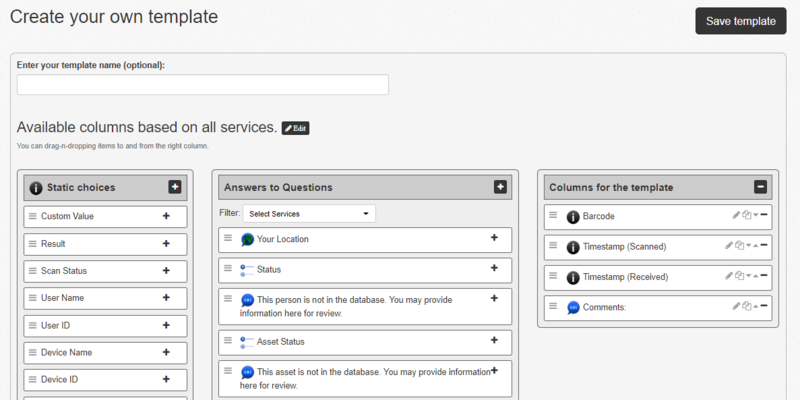 You can select Questions specific to a service, as well. This allows you to make sure that the question you select are actually the questions you want displayed. For instance, you may have two questions, both named “Check In”, but if you filter questions available by service and select your service “Attendance”, only one of those “Check In” questions would be available. Make sure the correct question is displayed by checking which service it belongs to. 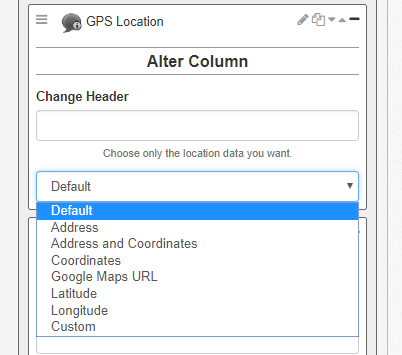 You can rename the column headers to match your destination document/sheet. Do this by select the pencil icon “Edit” on the values in the “Columns for the Template” column. You can also clone the values using the “Copy” button next to the Edit button. This is useful for showing multiple answers for a question in different columns, or if you need to repeat data. 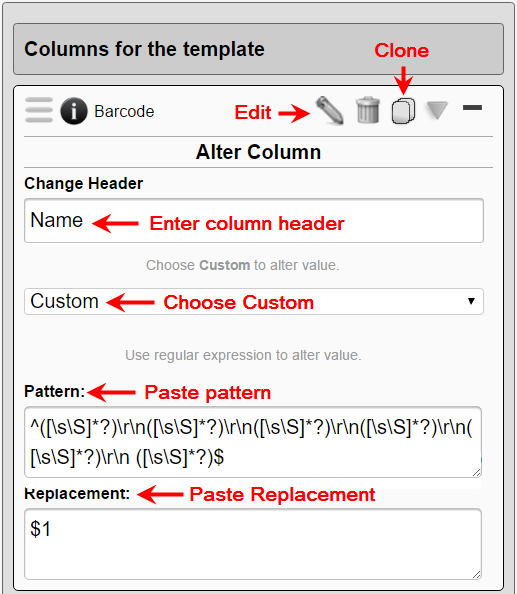 For advanced users you can use regular expression to parse structured data. This is covered below. 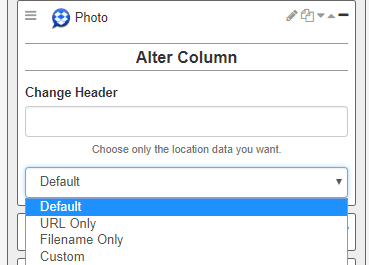 Create ‘placeholder’ columns in the template. 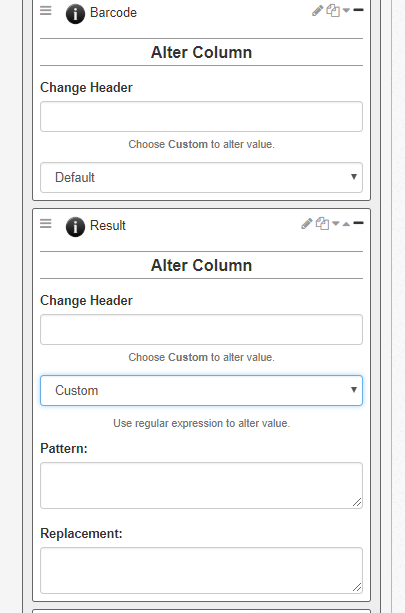 Drag and drop ‘Custom Value’ from the Static Choices column to the template column and then name it. You can optionally auto-fill all records with the same value by adding that value here. For certain questions or scan properties, there are special options for their specific data. This can be seen under the dropdown menu for the GPS Location property. The data collected can be output in several formats, giving the option for an Address (if recorded), GPS coordinates, specifically the latitude, longitude, as well as others. This can also be seen in the image below for photos collected using our Photo Collect feature. The options for a link to the photo include both the URL as well as the file name. Advanced: Why use Regular Expression? Regular Expressions (regex) can break up raw data embedded together in a barcode (or in the response text) into individual fields. It is commonly used for VCARD parsing (see section E below). Here are some examples. Notice the pattern begins with the ^ symbol and ends with the $ symbol. Also notice the ([\s\S]*?) pattern repeats six times for six elements. And (important) the \r\n repeats 5 times. You need to clone six times for six elements, each using the SAME pattern but with a different replacement ($1, $2, etc.). Notice the pattern begins with the ^ symbol and ends with the $ symbol. Also notice the ([\s\S]*?) pattern repeats six times for six elements. And (important) the \| symbols repeat 5 times. As with the line feed (\r\n) example, you need to clone six times for six elements, each using the SAME pattern but with a different replacement ($1, $2, etc.). The setup is the same as above but in the pattern you need to use \s as the separator. The setup is the same as above but in the pattern you need to use \t as the separator. The parsing of VCARD data is similar to the above except you will need to parse each field based on the field’s description. 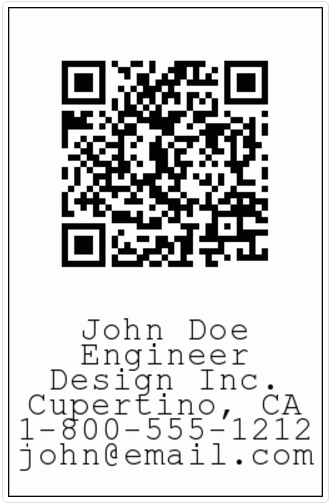 Please look here for VCARD Parsing Regex for Barcode Scanner.